When I caught the stomach flu last week, I was reminded of a funny story, so that’s what you’re getting tonight. If the fact that the stomach flu brought this story to mind concerns you, don’t worry. I won’t describe anything in gory detail. 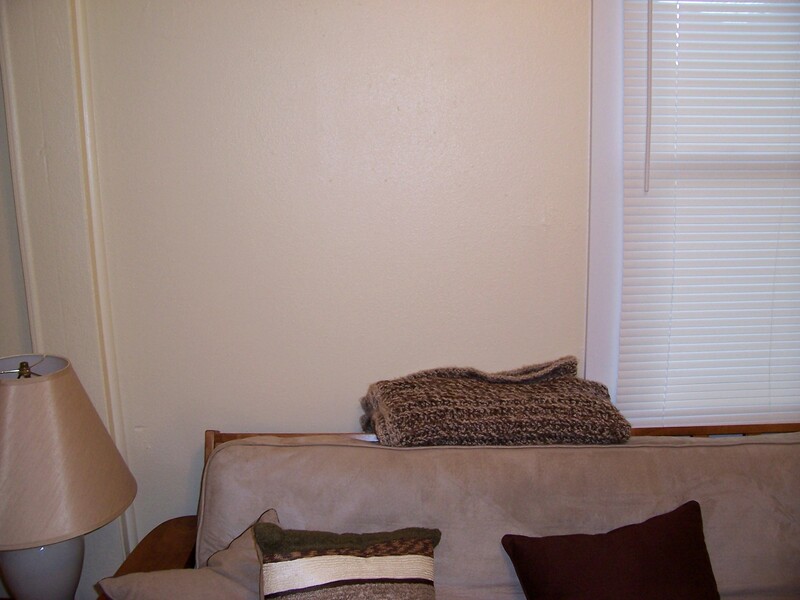 We were trying to take a picture of the couch by standing against the opposite wall. Clearly that worked well. 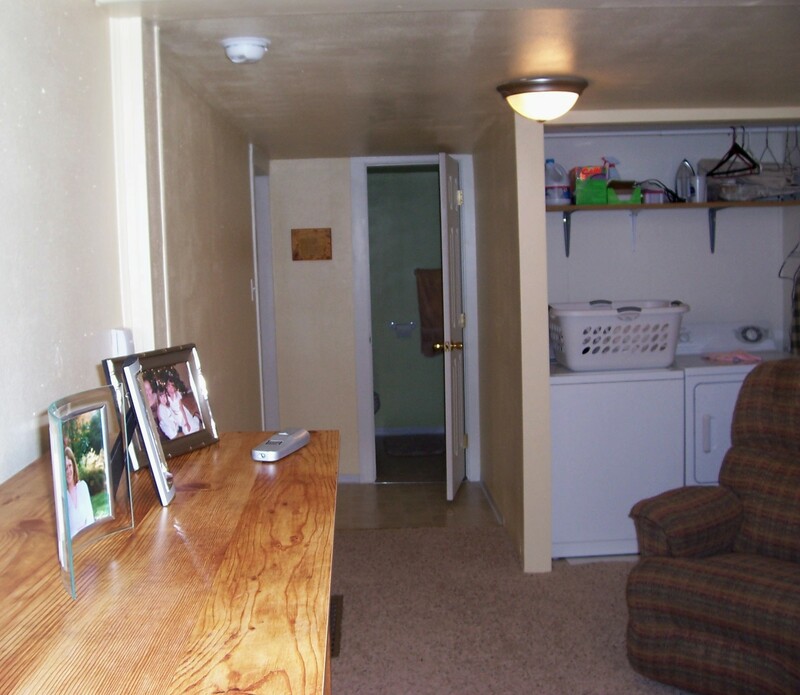 This is the living room/laundry room/hallway to the bathroom. A couple of months after we moved in, we were chilling in the living room, grading papers per usual, when the carbon monoxide detectors started doing their stupid “our batteries are dying!” beeps. After much struggle, we got them to stop beeping, got their batteries changed, and went on with our lives, thinking nothing of it. (It wasn’t 4 a.m.. … for once). Until the next morning, when Jordan started violently vomiting. In the shower. Naturally, we were concerned. What if, we thought, that hadn’t been the battery beep, and we were being poisoned each moment? What if I was fine because I’d left for a while that morning to work out? We didn’t really think it was carbon monoxide, especially since we’d just moved in and knew the house had passed inspection, but we figured we were better safe than sorry. As Jordan tried to finish his shower, I called the emergency number for carbon monoxide (not 911, just to clarify), explained what was going on, and asked what we should do. Did you know that if you even suspect carbon monoxide poisoning, they send police, fire trucks, and an ambulance, all with lights flashing and sirens blaring? We didn’t, either, but we learned it within minutes of that phone call. The cops banged on the door and hustled us out the door, clearly irritated that Jordan felt the need to dry off and put clothes on. We went out and sat in the ambulance, where they checked Jordan’s vitals and asked if he wanted to be tested for carbon monoxide poisoning (a test that, they explained, was quite pricey). We declined, choosing to wait and see if the firemen actually detected any carbon monoxide in our house. They did not. Turns out, Jordan just coincidentally caught the stomach flu the morning after the carbon monoxide detector’s batteries went out and the thing beeped at us. That was good news, obviously, but we were more than a little embarrassed. And that’s how we woke up the neighborhood over a stomach bug. I don’t even know what reader question to ask. Tell me something related to this. Wow. Good to know. Seriously embarrassing though! It makes me laugh because I would do the exact same thing! lol that is a great story! That would freak me out, too! Especially on a boat — you can’t escape! Haha. That’s one thing we don’t really have to worry about, at least! It’s so dry here that things dry out before they have a chance to mold. Now that I think about this I don’t know if we have a carbon monoxide detector. Hmm… May have to work on that. Congrats on the mag writing gig!! That’s awesome!! Really? It’s illegal here to not have one. I guess if it’s your own house, no one would know, but to pass inspections or be a rental, you have to have a certain number. That is SO something I would do. I ruined J’s favorite sweater by leaving it too close to the heater. I was just glad it didn’t burn the house down! This made me laugh! You have some awesome stories!!! Embarrassing slightly, but at least it wasn’t carbon monoxide poisoning!